Raptors President and General Manager Masai Ujiri will be hosting his second annual benefit in support of the Nelson Mandala Foundation and the charity that he co-founded in 2003, The Giant of Africa. The Toronto Raptors have had this date circled for a while: a game this Saturday at the ACC with the NBA champion Golden State Warriors. But there's a big event off the court, as well. 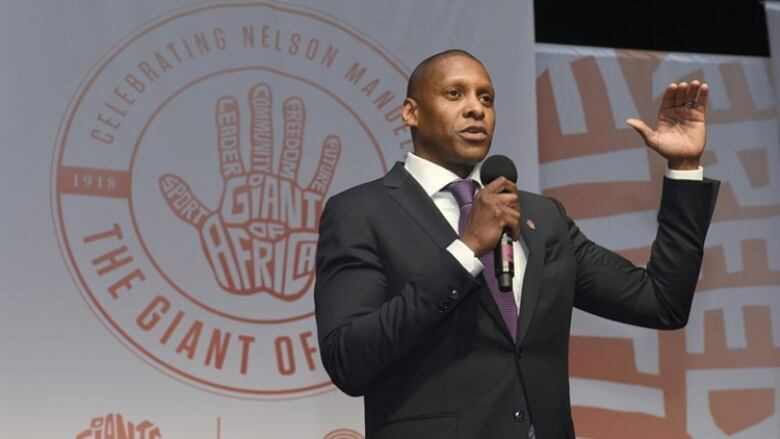 Raptors president and general manager Masai Ujiri will host his second annual benefit in support of the Nelson Mandela Foundation and the charity that he co-founded in 2003, The Giant of Africa. Ujiri, born in Zaria, Nigeria, is on a mission to use basketball as a means to educate and enrich the lives of the youth of Africa. He began the program in two countries, and is now planning for six countries this summer. "We're trying to give youth opportunity in Africa through basketball," he said on Metro Morning. "It keeps the youth off the streets in tough environments." Ujiri's program goes into some areas of extreme poverty, such as Kibera, a slum to the west of Nairobi, Kenya. To honour Mandela, both the Raptors and Warriors will wear limited edition warm-up shirts and the coaching staff and front office of both teams will don commemorative Giant of Africa lapel pins. Though the program works with basketball players, the goal is larger than that. "We can teach youth to think about basketball or sports in a different way. Not all of us are going to be professional players in the NBA — in fact very few. But we want to teach the kids there is something else to do." Ujiri lists sports journalists, medical doctors, lawyers and other professions that work with sport. Ujiri himself is an example of someone who doesn't play basketball but still got involved in the game, first as a talent scout with the Denver Nuggets and now as the Raptors GM. He is the first African-born general manager for a North American major league sports team. He said basketball can be a means for some young people in African cities to "figure out how to get an education." The tagline for his charity is, "basketball as a tool." The game, a year after Mandela's death, is a reminder to him of the sacrifice and hard work it took for African countries to get where they are today, and the work that remains. That work is something he is proud to do. "For me it's an obligation. It's something I have to do. I really don't feel pressure in the job I have. The only part I feel pressure is how much I help in Africa," he said. "If there is no one to continue this," he continued, "then I don't know how successful we have been here."